Yes Response were tasked with printing a recipe booklet and facilitating distribution across Europe all within 9 days. This publication was 124 pages, with a laminated cover and a print run of 6000 copies. The booklets then had to be distributed cost effectively (using three different delivery networks and service levels) to 24 European addresses with a critical launch on day 7 in Switzerland. Amazon have patented an innovation relating to delivering parcels by drones, unmanned aerial vehicles. In the future we may find ourselves searching skies for a drone parcel delivery! Customers will be beckoning them to the ground and irate neighbours attempting to warn them off. Amazon believes that drones buzzing overhead will be as normal as seeing mail trucks on the road. Amazons have stated that their Prime Air service will deliver packages to customers in 30 minutes or less. They intend to make this service a more efficient and safer way of delivering parcels. Yes Response have been tasked with producing personalised face masks for a client’s national conference. Yes Response specialise in providing a one-stop solution for clients exhibitions and events promotional distribution. A central hub for receiving all materials from multiple locations; conference pack collation, display delivery and set up and dismantling after the event. Yes Response are providing a van and driver for a two day event in Dundee in August, our driver is staying there for the duration. Let Yes Response remove the headaches from your important and time sensitive events, invariably with last minute additions! Yes Response have a dedicated resource ensuring all materials are delivered and collected on time, removing the fear of material being delayed and unfortunately sometimes, lost in a courier network. Recent highlighting of plastic pollution is making the awareness of paper and cardboard as the most environmentally friendly packaging. Two Sides UK recently found out in a snap survey consumers significant concerns regarding packaging in general. Coffee cups, plastic bottles, chocolate bar wrappers, crisp packets and take-away packaging were all perceived to be the most significant cause of litter. As we move towards a regenerative, circular economy as outlined in the UK’s 25-Year Environment Plan paper and cardboard will be an essential material as it is durable, renewable and recyclable. At Yes Response we pride ourselves on being efficient with our packaging usage in our mailings and fulfilment projects, finding suitably sized packaging to minimise costs and to help the environment. Yes Response still use polythene for magazine mailings as it minimises packaging materials and gives the magazine instant visibility to the recipient. Yes Response recycle 95% of unusable packaging. 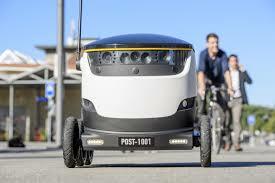 Swiss Post have been trialling robots to deliver post. During the robots deployment the delivery robots completed almost 200 runs over an area of 800km without any accidents or collisions. The box-like robot caused quite a stir and was being photographed constantly by passers-by! Road users were cautious at first but soon learnt how to share the road with the robots cautious driving style. Further tests will be needed in the future if the robots are to be used on Swiss pavements without supervision. However this is not currently possible due to Swiss legalities. Starship Technologies the manufacturer of the delivery robots aims to do further tests and gather further data from other locations across the world. Robots and drones will become a significant force in parcel deliveries within the next 5-10 years in the UK so watch out!